Mt. Angel Brewing Company is unique in that it is a soda brewery. They brew sodas and only sodas which can be purchased in either bottles or various keg sizes. Their original flavor was their Old Fashioned Root Beer though they’ve since expanded to unique flavors like Marionberry and Hazelnut as well as the more traditional Orange Cream. They’ve won several awards for their brew. 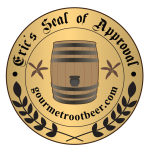 They took the Silver Metal at 2012 National Open Root Beer Competition (a category of the National Open Beer Competition), where the Gold and Bronze went to Seal of Approval brews so I was excited to get this to say the least. Getting it was a bit of a pain even though it’s only about a 4 hour drive to their brewery. I didn’t want to mail order it at first, hoping I’d be down there for some reason or another, but eventually I got around to getting my two bottles. Their motto is “Venite et Gaudete” which is “Come and Rejoice” The motto seems to be on a seal of some sort which only appears on their labels, the website is quite mute on the subject. The Body has a rich strong minty flavor with a hint of fruity. It isn’t really creamy and is a tad bitter and sticky. The Bite is pretty non-existent. There’s a little carbonation tingle and the slightest mint burn but really nothing. The Head is short, very short, but frothy. The Aftertaste is very minty and a little bitter and fruity. So this root beer really reminds me of Ozark Mountain, minus the creamy vanilla and the beautiful Head. They even both have green labels. While the creamy minty brews are a favorite of mine, this only has the minty part of the equation. Then that hint of fruity detracts and the Head is poor. In fact on the second bottle I tried, the Head was non-existent but I gave them the benefit of the doubt and rated it with the Head from the first bottle, which was still really short. All in all, it’s a decent brew but not one of my favorites by any means. See how it rates against other root beers. The Body is minty and creamy complimenting a full sassafras flavor. The vanilla hints give it a nice rich texture and flavor. The Bite is subtle; just enough to let you know it’s there but not too much. The Head is huge and very frothy! It rivals the other top root beer Heads out there. It lasts a long time as well. The Aftertaste is rich wintergreen and vanilla with the slightest accents of caramel. Yum, yum, yum! I love this root beer. It reminds me a lot of River City with that creamy minty goodness. Maybe they have a green label because of all the mint. Whatever the reason, I wish I had ordered more. See how it rates against other root beers.